Manufacturers often use a Nitrogen gas purge to displace oxygen from the package before sealing it closed. Oxygen needs to be eliminated during packaging because prolonged exposure to the food will affect it's texture, taste, and freshness. The presence of oxygen introduces moisture which can deteriorate the food quality. 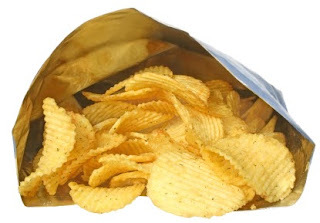 Why Use Nitrogen for Food Packaging? Nitrogen is a a clean, dry, inert gas that can eliminate or reduce the presence of oxygen for greater freshness and shelf life. Nitrogen gas is used in wine bottling, draft beer service, controlled atmosphere storage, vertical form fill packaging, and various kinds of food packaging (See: Nitrogen for the Food and Wine Industry). Using Nitrogen to purge food packaging of oxygen is a safe practice widely used throughout the food industry. Another reason that Nitrogen is often used for food packaging is to provide a pressurized atmosphere that prevents package collapse. Using N2 gas in this way helps ensure that more delicate foods, such as chips and crackers, won't get crushed in the bags where they're stored. The best way to use Nitrogen in food packaging is with a Nitrogen Generator. This is a safe, reliable, and cost effective alternative to high pressure N2 cylinders. Where high pressure N2 cylinders require delivery, storage, gas company contracts, and manual change-outs, a Nitrogen Generator is installed at the point of process and produces high purity N2 gas on-demand directly from the air we breathe. South-Tek Systems is a leading designer and manufacturer of Nitrogen Gas Generating Systems. We use a Flow Verification System to ensure that a food packaging facility is fitted with the proper size and style of Nitrogen Generator to meet packaging demands. To learn more about Nitrogen Generators for the Food Packaging Industry, contact South-Tek Systems today at 888-526-6284.